A month or so ago while hiking a nearly eight-mile trail near Dayton, Ohio I was caught in a summer rainstorm. The downpour was so fierce the trail turned into a fast flowing stream several inches deep, and above me, the branches of the solid oaks and maples and buckeyes cracked and snapped as wind gusts blew through. I began counting—one, one thousand; two, one thousand—between peals of thunder but gave up when they seemed to erupt on top of each other and the lightning flashed all around me like a strobe light. I felt so small and exposed. I may as well have been naked. The storm erupted during the last leg of the trail. I’d seen and heard it coming, the sky turning a deep blue against the new green of the leaves and the thunder rumbling its low warning in the distance. I picked up my pace. I was only a mile or so out. I was convinced I could beat it back to my car. 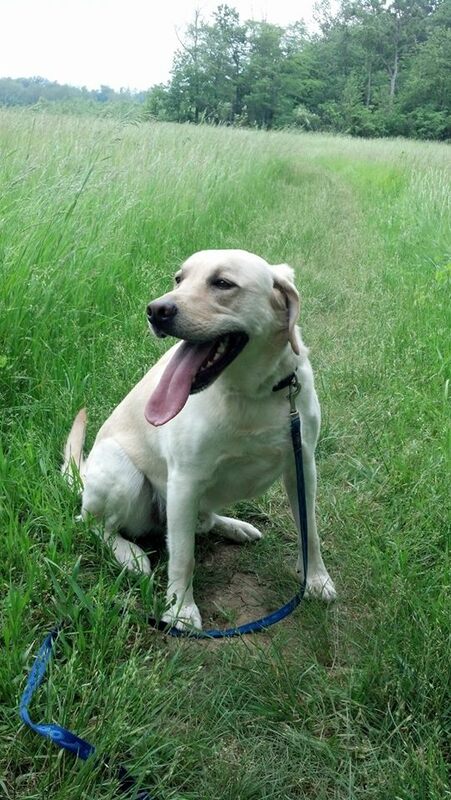 I was hiking alone except for Amos, my three-year-old yellow Labrador retriever. He’s an ideal hiking and walking companion, willing to go at a moment’s notice, never too busy with work. Quiet. Serene. Willful. Unburdened. Amos lives only in the present. Unlike my obsessive brain churning and churning and churning even as my legs carry me forward, Amos does not live in his head. His is a wholly physical existence—when he wants to eat, sleep, play, chew, fetch, he does it. There is nothing else for him. Even his affection (it may not even be affection; I will never know) is wholly physical—he plants his haunches on my feet and leans against my shins. He looks up and behind him, his wide brown eyes shining. I don’t know how his brain is firing in those moments to make his eyes look so full of meaning, but once I stroke him he looks away unless I stop. It’s unsettling, this way he has of getting from me what he wants. I pet him, yank his ears. I rub his belly and chest, hug him. He elicits these physical manifestations of my affection for him with only one look or movement of his body. I’m well trained. Amos was an impulse buy. We did not intend to get a dog, nor did we want or need a dog. My husband Sam and I were in the mall and decided to see the puppies at the pet shop, the one place you’re not supposed to buy puppies since many of them are products of puppy mills. But when we saw him, nearly three months old, twice as big as all the other puppies in glass kennels, lying spread eagle on his back, we melted. He cost $600. We balked. But the pet shop owner intervened. We didn’t really know what “get rid of him” meant but we didn’t ask. It didn’t sound good. We couldn’t afford to take him, not because of the money but because of our situation. We already had two dogs. I was living in Indiana during the week while teaching and going to graduate school. I commuted to Ohio on the weekends where Sam lived full time for his job as a pastor. My life was a logistical hell. A puppy would make that worse. I knew I’d be the one to potty train him, teach him to sit and stay, take him for walks. I tell Sam that it’s really all his fault. He said he wanted Amos to be his dog. Our other two dogs, a shepherd mix and a yellow Lab, pre-dated Sam and were mostly mine. He wanted Amos’ affections to lie squarely on him because the other two mostly come to me. On top of that, Sam pulled the one heart string he knew would force me to assent (apart from the fact that he’s a yellow Lab—the breed for which I have the greatest affinity). After playing with the puppy for forty-five minutes in the pet shop and even naming him, I was still unsure until Sam said, “We’d be saving him.” Minutes later we had a new puppy. Three years later, because of that afternoon storm, I began thinking about what separates me from the wholly physical existence Amos lives. There are the obvious separations—I know I exist in the world; I am consciously aware of that, while I doubt Amos does. Most days, I have language ability. When the rain started, I began to jog. Amos was all the happier for it since the faster we go the better. But he seemed to understand that something in my demeanor had changed and rather than trotting ahead of me like he normally does, he stayed by my side. As I jogged, I pulled out my trail map to make sure I was where I was supposed to be. I determined I was nearly done. But then I took a wrong turn. At a fork on the trail, I went left rather than right. I missed the trail marker to the right that led to the parking lot. Instead, I followed the marker that led me back around another one-mile loop. I was to the next marker before I realized my mistake. I pulled my trail map out of my pocket, but by this time it was pouring. I could hardly see for the rain dripping off the bill of my hat and the wind blowing the rain sideways into my face. My paper map disintegrated in the wet. My hiking boots and socks were soaked through and my shirt and shorts suctioned to my body as if I were standing fully clothed in my bathroom shower. We ran even harder now as the thunder and lightning erupted around us. I had to hold my hat so the wind didn’t catch the bill and pull it off my head. “It’s okay, Amos. We’re almost there. We’re okay.” My heart was pounding and with each snap and crack of the branches above us, I saw massive trees fall in front and behind us in my imagination. “You’re okay, Buddy,” I told Amos. When we made it back to the same fork in the trail, I didn’t realize it was the same one I had passed before. With my map in wet shreds, unreadable, I made the same mistake and started a second time around the mile loop I had just done. I began having visions of being stuck on this trail into the night, unable to find my way out. Amos continued running beside me, but now he looked up at me every few seconds—something he never does normally. “It’s okay, we’ll be okay,” became a stupid mantra I repeated every few seconds to soothe myself. In these moments, I felt I was living a wholly physical life, cold, drenched. I was afraid but in a present-tense mindless sort of way that simply forced me to keep moving forward. I did not know where I was going, how to get there, or even if I would get there. Amos continued looking up at me as we ran along, side-by-side. While I have no doubt Amos was experiencing this differently than I was, it seems to me now we were in a predicament that somehow joined us—maybe because he sensed my fear, maybe because … I don’t know. Maybe he felt his own sense of fear, mirroring mine in whatever way dogs experience fear. When we got home that evening, Amos wouldn’t let me out of his sight. He followed me around the house to the point of annoyance, walking beside me wherever I went. I don’t know what that means for him, why he did it, or continues to even now. But for me, it solidified my sense he is now my dog and will always belong to me. I was away from home a few weeks ago, and Sam said Amos lay in the kitchen facing the door, perhaps watching for me. When I got home, he resumed his place by my side, as if I’d never left.